Je m’appelle Claire. J’aime lire! Let’s explore how these students are introducing themselves and let’s find out about their likes and dislikes. Log in to your online textbooks and go to chapter 1 “Faisons connaissance !”. Click on the Book Pages tab and select the Mise en Train Salut, les copains! section on page 18-20. Go through all sections from Stratégie to number 8. Practice your listening skills by listening to all dialogues. (Click on the sound button in each section.) Repeat after each sentence to practice your speaking skills. Make sure you have a good understanding of their introductions before starting the exercises. You may want to listen one more time to all presentations while following with the text by clicking on the play all button above Activités. Go to the Activités menu and do activities 1 to 5, in that order. For each activity, you will read all questions that appear in a separate window. To answer those questions, you will need to click on Cahier électronique. Once this dialogue box opens, you can enter your responses and click on “SAVE” to save them. Post all your answers to the above exercises on your blogs under the unit title Faisons connaissance! You may copy and paste your answers directly on your blogs or post screen shots of your answers. You are expected to write full sentences as much as possible. Deadline for completion: Next class on Monday, November 30. Grade 6 – Bienvenue dans la classe de 2014-2015! Welcome to this year’s Grade 6 French! I hope you are all excited to learn this new language… but, actually, is it really a totally new language for you? 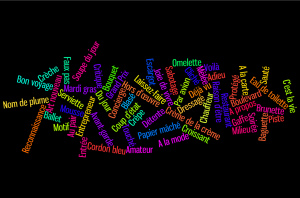 Have a look at this Wordle and see how many French expressions or words you already know. You will be surprised to find out that you are probably using already a number of them! 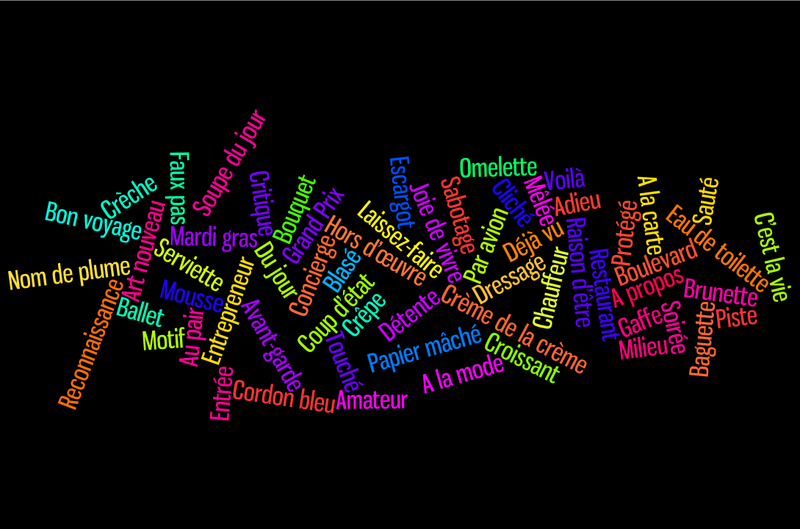 Now, make your own Wordle in your blogs with the French words you know. They could be words that are used in the English language, just like those above, or they could be French words that you have learned or come across before joining this class. Today during your period 7 French class, you will practice online with Linguascope the numbers we have learned in our unit and expand your knowledge by challenging more difficult numbers in French. Once you have completed all activities online and you think you are ready to apply your knowledge, you will work on the worksheets that will be given out in class. First, login to the Linguascope home page with our school username and password (posted on the whiteboard in our classroom) and select the Elementary section for learning. 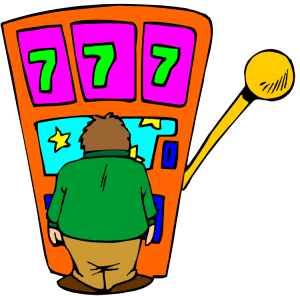 You will be directed to the Houlala page where you will select Galaxie Trois. There you will go to Planète nombres and practice all activities either on your own or with a partner if you wish to be a bit competitive. Next, you will leave the Elementary section of Linguascope and go to the Beginner section that will take you to the Bonjour page. In Les Bases (basic vocabulary) you will select Les dizaines. Practice all activities from “Présentation” to “Contrôle final” and check how much you have learned. Once you think you can confidently use those numbers, practice on the worksheets. You may complete them at home. Please complete all exercises of 1ère Etape of your “Practice and Activity” worksheets on chapter 1. This assignment will be due next class. Let’s explore the conversation taking place between our young students at the collège! Log in to your online textbooks and go to chapter 2 “Vive l’école !”. Click on the Book Pages tab and select the Mise en Train La Rentrée section on page 48-50. Go through all sections from Stratégie to number 10. Practice your listening skills by listening to all dialogues. (Click on the sound button in each section.) Repeat after each dialogue to practice your speaking skills. Make sure you have a good understanding of the story before starting the exercises. You may want to listen one more time to the whole episode while following with the text by clicking on the play all button above Activités. Go to the Activités menu and do activities 1 to 6. Save your answers on the Cahier électronique. 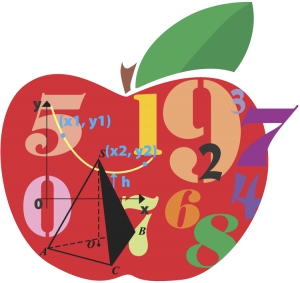 Post all your answers to the above exercises on your blogs under the unit title Vive l’école! You may copy and paste your answers directly on your blogs or post screen shots of your answers. You are expected to write full sentences as much as possible. Deadline for completion: Next class on Friday, February 8.